Whether you like to get some exercise on your own or take in a class, the Mirasol Fitness Center has what you want. The fitness center features TechnoGym fitness equipment, a great training solution for those who find traditional gyms intimidating. The easy-on, easy-off design fits the needs of our mature resident community, while providing a challenge for the experienced fitness guru. 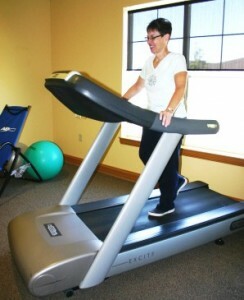 We also have an Excite Treadmill, which will take your mind off the fact you are working out. With its large print screen, quick start, and goal-specific programming, the treadmill absorbs your impact and monitors your heart rate.